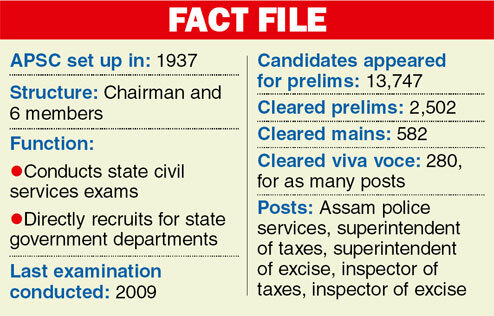 Guwahati, May 31 : The Assam Public Service Commission (APSC) is planning to do away with the optional subject in the preliminary examination for the combined competitive examinations. The revision of syllabus will be on the lines of the Union Public Service Commission (UPSC), which recently revised its syllabus for IAS and allied services examinations. The commission will also introduce an online application system soon to enable candidates to apply for competitive examinations online. The new syllabus, which proposes to do away with the optional subject, will test candidates appearing for the prelims on 200 marks objective-type questions on general studies, 70 per cent of which will be on history, geography and culture of Assam. Another 200-mark paper will test their general English. The commission’s chairman, Rakesh Kumar Paul, told The Telegraph today that they have moved the state government, seeking its nod to introduce the syllabus in the next civil services examination. “After the UPSC decided to do away with the optional subject, Karnataka and Maharashtra followed. We want to do the same here. There are 32 optional subjects and but it will be more helpful for candidates if we follow a uniform curriculum. Besides, most of the optional subjects are old and in the new pattern we can test their knowledge on diverse subjects,” he said. “The candidates should be tested for their suitability as civil servants and not as a source of information. Besides, according to the revised syllabus, candidates will write the same papers and their answers will be evaluated on the same standards. It will also encourage candidates to study history, culture, geography, society and people of Assam as 70 per cent of the paper will be on Assam,” Paul added. After the prelims, a candidate appears for the mains, in which he/she is tested on 1,400 marks divided into four papers. The viva voce carries 200 marks. Paul said the online application system will reduce paper work for applicants as well as the processing time. “Besides, there will be no fear of delayed submission of applications.” He said the commission has reached an agreement with State Bank of India, through which candidates would be able to pay their examination fees online. The APSC has already computerised its examination procedure and is using the optical mark recognition technology to screen answer scripts. The APSC had started its website, which shares recruitment information and results, in 2009. He said they had also moved the state government for financial autonomy. “At present, we require government sanction for release of funds and this delays our activities. In Mizoram and Jammu and Kashmir, the state public service commissions enjoy total financial autonomy but here we have partial autonomy. We have to take clearance from the state government for funds before initiating any activity,” he added. The commission will also set up a medical unit and an ATM on its office premises at Khanapara here to assist its 280 staff members.